Precision Machine & Manufacturing Acquired via MBO | CVF Capital Partners, Inc.
Central Valley Fund II (“CVF”), a California-based private equity firm, announced today that it has provided $3.66M in Mezzanine debt and equity capital to support the acquisition of Precision Machine & Manufacturing, Inc. (“PMM” or the “Company”) in partnership with management, led by Kirk Morton, and Socius Capital (“Socius”). Terms of the transaction were not disclosed. 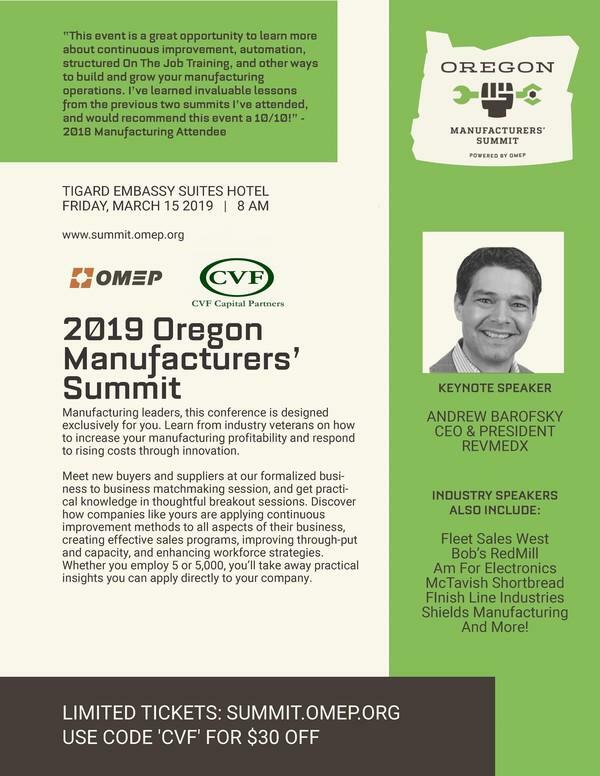 Based in Eugene, Oregon, PMM is a leading industrial, specialty rotary valve, rotary feeder and screw conveyor manufacturer, providing technical and mission critical products to more than 1,000 end users, cement plants, wood and paper mills and energy and mineral industries. PMM’s products are designed to convey virtually any dry, granular or powdery material. The Company’s tight product tolerances, high quality materials and finishes are ideal for abrasive substances such as fly ash, coal, coke, diatomaceous earth and pebble lime. PMM’s management team will continue to be led by Kirk Morton, President, who has been leading the company’s daily sales and production operations since 2010 and will continue to lead the Company and with a significant investment. Started in 1977, Precision Machine & Manufacturing has grown from a small machine shop into a complete OEM facility, and is recognized as one of the nation’s leading designers and manufacturers of precision rotary valves, feeders and screw conveyor material handling systems and components. PMM initially targeted the wood products industry with high quality feeders and screw conveyors. With the introduction of the modular PMV® rotary valve, the company expanded its reach into the co-generation, mining, cement, chemical and pharmaceutical industries, among others. PMM also manufacturers feeders and parts for the blower truck industry, and offers custom machining and fabrication services, utilizing the latest CNC and robotic equipment. The Central Valley Fund was established in 2005 and to finance later stage growth and buy outs through mezzanine and preferred equity investments and manages over $140 million in committed capital. The fund has offices in Davis, CA and Fresno, CA. It is focused on making investments in California’s Central Valley and throughout Western U.S. For more information, please visit http://www.centralvalleyfund.com. Socius Capital is an independent private equity sponsor that focuses on recapitalizations of businesses in the lower middle market, located in the western and southeastern United States. Companies of interest typically have $2-6 mm in EBITDA, and an in-place management team, looking for an active financial partner to help the business achieve their growth objectives. Socius Capital operates from offices in Idaho, Florida and Georgia. For more information: www.sociuscapital.com .